Each $55 box contains 30 packs. Each pack contains 5 cards. 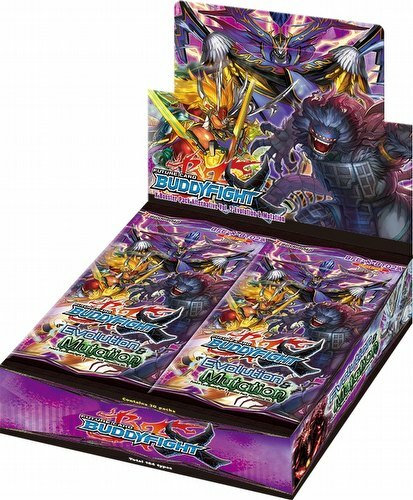 Future Card Buddyfight Evolution and Mutation boosters feature the Dragon World, Legend World, Darkness Dragon World, Star Dragon World, and more! There are 143 different cards in the set plus ??? SECRET cards (7 BR, 22 RRR, 24 RR, 30 R, 30 U, and 30 C). Some cards are reissues. Each pack contains 5 cards, one of which is a Rare or better. There is one SECRET pack guaranteed in every booster box. Parallel foil versions of commons, uncommons, and rares are randomly inserted.